The Alembyc: Daycare - with pictures! Apologies to Bennigan's and their club sandwich. I wound up as sick as Bry yesterday and last night. Fortunately (more or less) I spent most of my evening and night being ill, so I didn't have to cancel classes...and I had today to recuperate (more or less). But I'll spare you the details of my miseries; we have pictures to peruse! We got Kath off to daycare as usual and then ran a number of errands in town during the morning, enjoying our 'new' car and the new freedom it's giving us. Around quarter to twelve we stopped in at the daycare to see the director and drop off our payment for the month. She was quite gracious about allowing us to be 'late' with it next month as well (they prefer to be paid at the beginning of the month rather than at the end, understandably) and was happy to let us sign Katherine up for special supplementary classes that will run for the next two months as well. For an additional hundred thousand won she'll be getting Logic, Art, Math, Music, and Science during the afternoons (that includes the 'textbook' and other supplies, apparently, as well). We hope she'll enjoy it all! After our visit with the director we were invited to come in and see the class settling down to lunch. The songsaengnim moved gracefully around the room with a pot of rice, filling up the little cups in the presented lunch trays, and the children sat happily eating and chattering. 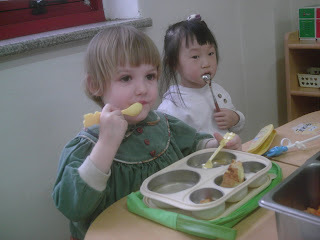 Our sweet daughter ran over to us with a big smile, dispensed several hugs, and then resumed her seat with her classmates, picking up her miniature fork. Her friend Choon-so greeted us with equal enthusiasm and had to be asked several times, patiently, to "Anju-seyo!" - please sit down- and go back to her lunch. Katherine, who won't touch rice at home, daintily began to nibble on her rice, a forkful at a time, interspersed with ladylike sips of the clear beef broth - "soup with nothing in it", as she likes to order whenever we eat out. We sat on the floor and looked round, and the director gave us permission to take photos. And, for your enjoyment, here they are! Katherine with her lunch tray. She has beef broth, rice, a scrap of pickled vegetable, and a half-a-savory-pancake. Note the adorable rabbit-eared 'joined chopsticks' to her left. And finally, here she is at the end of the day, with her friend Choon-so, outside the Honeybee Restaurant at Myongji Ipgu, which Choon-so's grandparents own and operate. Aren't they an adorable pair? Oh, by the way - the other errand we had to run, after we left Katherine happily eating, was to go out to the Yongin Department of Motor Vehicles and exchange our car's license plates. The ones we had actually belong to the used-car lot, and one of the gentlemen from the lot drove down to Yongin today to meet Bry and give him his new, legal plates. There was a bit of a mixup (we wound up waiting at the wrong office) but we did eventually get the new plates - AND Bry got his Korean driver's license, which was due to expire this May, extended for the next two years... without PAYING anything for the privilege! And we met some interesting people, so there's yet again a silver lining to our various clouds. G'day! Love your blog. Your 'everyday' take on such a different culture is a pleasure to read. March 27, 2007 at 8:44 p.m.
We have (finally) started painting Steven's room. We've got the primer on half the room, and will be putting the colour coat on this weekend. Then we have to move all his stuff over and work on the other half. One of these days it may actually get finished! Thanks for sharing the pictures, and do post more if you can. March 28, 2007 at 7:23 a.m.
March 28, 2007 at 9:03 a.m.
Whew! It's been a busy few days for us. Daniel's seventh birthday and the accompanying party have come and gone. He earnestly desired a "haunted house" theme. Has anyone ever TRIED to acquire "spooky stuff" (i.e. skeletons, jack'o'lanterns, fake spider webbing etc) when it is NOT Halloween? Then you have my understanding and complete sympathy. I had to be creative (which is so difficult for me, right?) I bought a paper skeleton from a teacher supply store and the kids had a great time trying to "pin the bones" (head, arms,legs etc) onto the torso, blindfolded. I designed two games for them, one a "treasure hunt" and one Trick or Treat game, where they had to draw cards (which I made--I LOVE my computer!) and, depending on the card, get a treat, or have to do a trick first. I also put together some crafts--"make-your-own-mask" was a hit, as was "design-your own-jack'o'lantern". The grand finale, of course, was two birthday cakes (I made two because the party was a combined party with my son and his best friend, who share the same birthday) carefully shaped and decorated as jack'o'lanterns. If I do say so myself, they were pretty impressive. The kids loved them. So, yes, lots of fun, but I have been very busy, not to mention co-ordinating all this while dealing with an unpleasant, if mild, stomach virus of some sort, and a baby who is currently developing molars and learning to walk, simultaneously. Well, things have calmed down a bit and all the kids are asleep, so I can steal a few moments to comment quickly. It's bedtime here and morning will come all too soon, so I must go. I love you guys and hope to be able to see you on Skype soon! March 31, 2007 at 7:45 p.m.